For users of LiveLink™ for AutoCAD®, COMSOL Multiphysics® software version 5.3 includes curves and points when synchronizing and extends support to new versions of certain CAD file formats. Read more about the LiveLink™ for AutoCAD® updates below. You can now transfer wireframe geometries when synchronizing between AutoCAD® designs and COMSOL Multiphysics® models using LiveLink™ for AutoCAD®. A wireframe approximation of the geometry is suitable for various simulations, such as when beam elements and the like can be used and when performance and memory requirements are important. 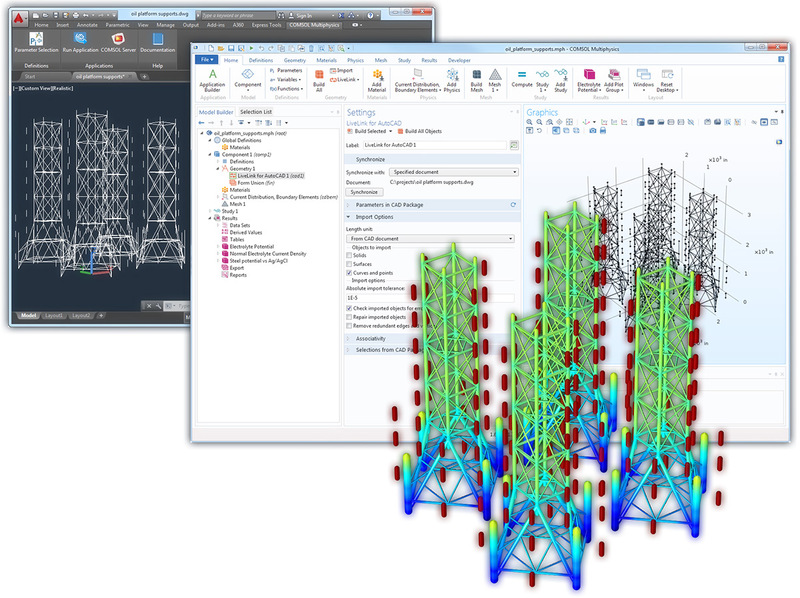 The wireframe geometry of oil platform supports designed with the AutoCAD® software, along with their respective sacrificial anodes, is synchronized to the COMSOL Multiphysics® software using LiveLink™ for AutoCAD®. The size and complexity of the geometry means that it is more efficient to simulate corrosion protection by using beam elements. The AutoCAD® wireframe geometry can now be directly utilized by the COMSOL Multiphysics® software for much easier simulation. The wireframe geometry of oil platform supports designed with the AutoCAD® software, along with their respective sacrificial anodes, is synchronized to the COMSOL Multiphysics® software using LiveLink™ for AutoCAD®. The size and complexity of the geometry means that it is more efficient to simulate corrosion protection by using beam elements. The AutoCAD® wireframe geometry can now be directly utilized by the COMSOL Multiphysics® software for much easier simulation. Autodesk, the Autodesk logo, AutoCAD, and Inventor are registered trademarks or trademarks of Autodesk, Inc., and/or its subsidiaries and/or affiliates in the USA and/or other countries. ACIS is a registered trademark of Spatial Corporation. Parasolid and NX are trademarks or registered trademarks of Siemens Product Lifecycle Management Software Inc. or its subsidiaries in the United States and in other countries. SOLIDWORKS is a registered trademark of Dassault Systèmes SOLIDWORKS Corp. COMSOL AB and its subsidiaries and products are not affiliated with, endorsed by, sponsored by, or supported by these trademark owners.